Learn more about Kristin O'Donnell Tubb Here! Read more about A DOG LIKE DAISY on Goodreads! Order A DOG LIKE DAISY! 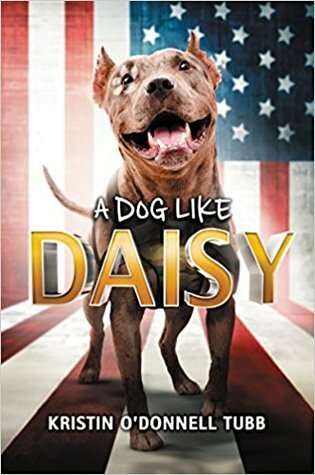 Max meets A Dog Called Homeless in this sweet and poignant middle grade novel told from the humorous, thoughtful perspective of a rescued pit bull as she trains to be a service dog for an injured veteran and his family. Determined to become the elite protector the colonel needs, Daisy vows to ace the service dog test. She’ll accept the ridiculous leash and learn to sit, heel, shake, even do your business, Daisy when told to. But Daisy must first learn how to face her own fears from the past or risk losing the family she’s so desperate to guard—again. Daisy is a dog that just wants to do good. So, when an older man and his family come in looking for dogs, Daisy knows to be on her best behavior. Humans normally pick the younger puppies anyway, and the two year old pit-bull mix doesn't really think she has a shot. But before she knows it, she's in a car and on her way home with her new family, and she couldn't be happier! She's getting a home after so many years without one - but wait, did they just mention trying to find a different dog if she didn't pass this test? Daisy doesn't really know what a service dog is yet, or what that entails for her, but she doesn't want to go back to the pound. She'll do anything she can to stay with Colonel Victor - her handler - and help him with whatever he needs. I was hooked on this book from the very first page. A DOG LIKE DAISY is about a service dog (in training)! There are lots of books about dogs out there, but this is the first book I have seen that tackles the life of a service dog. Not only is this book about service dogs, but the entire story is told through Daisy's eyes. It's such a unique and interesting addition to an already exciting story. Daisy has such a light, happy voice, and the way she speaks of things happening around her only adds to the magic of the story. I think readers will really love her thoughts on what is happening around her and her perspective on things. I have my own service dog (a chocolate lab named Scarlet) so to see what could potentially be her thoughts reflected in the pages was a wonderful experience for me. I also went through the route of "owner-training" my dog (of course, with some professional assistance too!) like the character in this story. To see that training process described made my smile grow bigger and bigger. To say the least, it means a lot to me to see the story of a service dog reflected in the pages of this story. A lot of what happens in the book is a bit exaggerated, and the plot moves incredibly quickly. This book doesn't showcase all of what goes into service dog training, and instead, only focuses on some of the tasks she performs and a lot of what is happening at home with her family. In terms of educational value, I think Daisy's story has a lot to offer. It's a lovely introduction to service dogs, and the plot of the book helps to explain why the tasks they do are so beneficial as well. This book is also well-researched. The author spoke to a service dog organization called Southeastern Guide Dogs. Making sure a book is well-researched is an absolute priority (and it helps to make the story more authentic and real too), so I was very happy to read about some of the research that was done. For example, this book helped to illustrate and comment on some of the difficulties that service dog handlers face. There was a point in the book when Daisy and Colonel Victor go to a grocery store, and one of the greeters asks for "national certification" for Daisy before the two of them are allowed into the store. In the United States, there is no such thing as "national service dog certification", and service dogs are allowed to access any public area, or anywhere the general public would be allowed to access. Sometimes, service animal organizations (like the one Colonel Victor went through for help) have their own testing and certification process, but you don't have to have certification to prove your service animal helps. Though it was a small moment in the book, I really liked that it was added. There was a few issues I had with the book. In one of the chapters, Colonel Victor is having a flashback, and in order to ground him, Daisy ends up biting his hand. I don't work for a service dog organization, but I've heard that if a dog ends up biting someone and drawing blood, that they should be considered to be "washed out" of the program (that means no longer allowed to be a service dog). (Spoiler alert) While Daisy does not become a service dog at the end of the book, I feel like the service dog organization should have washed her out earlier or at least, shown their thought process behind allowing her to continue work. Then again, this book is told through Daisy's perspective, so whether or not she would be aware of this is up for debate. Also, the use of disabled dogs as service dogs (Daisy has trouble hearing in one ear) is still very widely debated/frowned upon, and the book didn’t really touch on this aspect as much as it maybe should have. Overall, I really enjoyed this story. It is a very quick read, and is a great way to introduce the concept of service dogs to children. This book is wonderful for dog-lovers and for younger children who may have a service dog themselves, and I’m incredibly happy that this story featured a (service) dog like Daisy.